As with most sports, the action of the game can sometimes be hidden from view. It's the little things in the trenches that no one sees that make all the difference. As a swimmer, you train to have speed, but few people, if any, ever see the reason for your speed - the technical side of a perfect arm movement and constant kick. Why can't they see it? Well, you do it underwater! 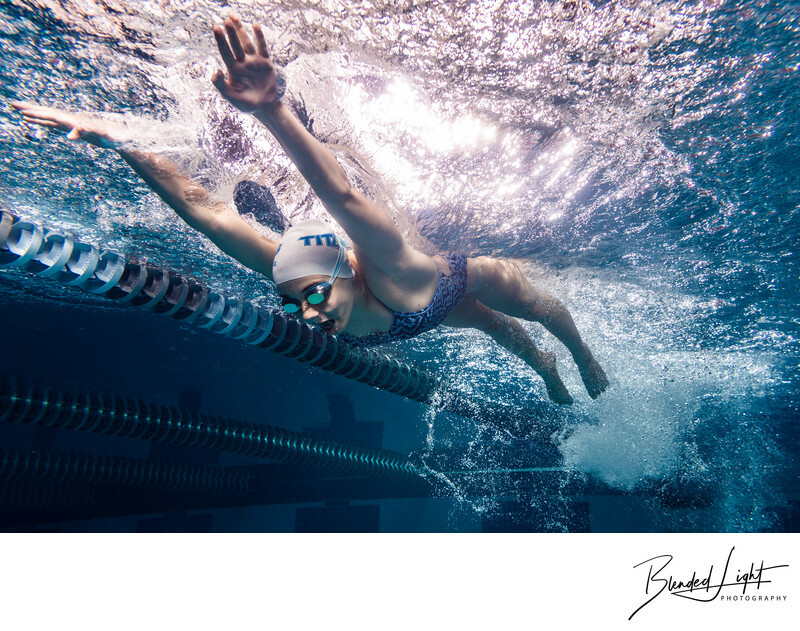 As North Carolina's only underwater swim photographer, I love being in the pool and creating images that capture the beauty of what happens where people can't see. In this image, we see my client, who is a flyer, stretching those her upper body and arms as they crash through the water's surface, while pulling her chest down to initiate her powerful kicks. Being below the water's surface and my swimmer, I can view and time her strokes so that we capture the exact moment the action occurs. This underwater photography is almost all about timing - getting or track with my swimmer's movement - the strokes, the kicks, the breaths - and then being prepared to fire my shutter at that perfect moment. If you're interested in learning more or booking a session, Contact Me and I'll be glad to help you out! 1/250; f/5.0; ISO 160; 24.0 mm.